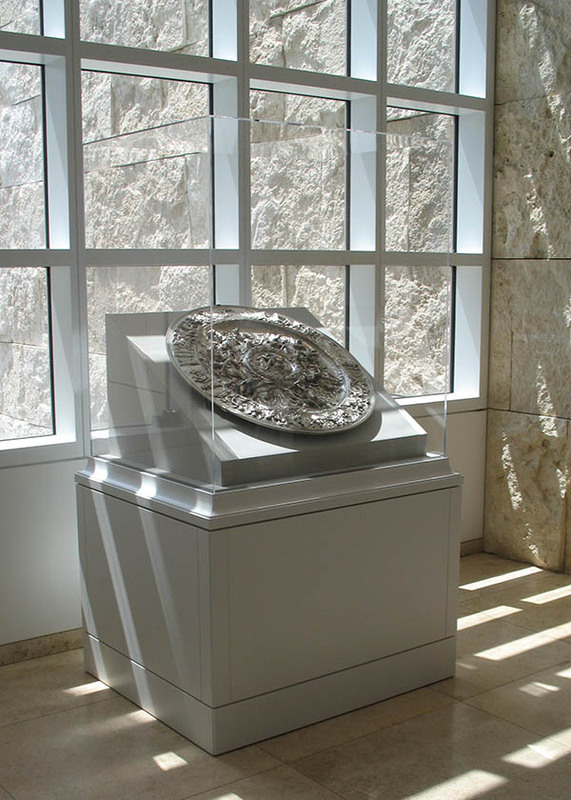 During the first week of August, the J. Paul Getty Museum’s select collection of European silver, with examples dating from about 1600 to 1800, was moved and displayed in a new location – a south-facing section of the South Pavilion with abundant natural light. Previously, these pieces had been shown individually in various galleries, with just two showcases exclusively reserved for silver objects, all primarily French. 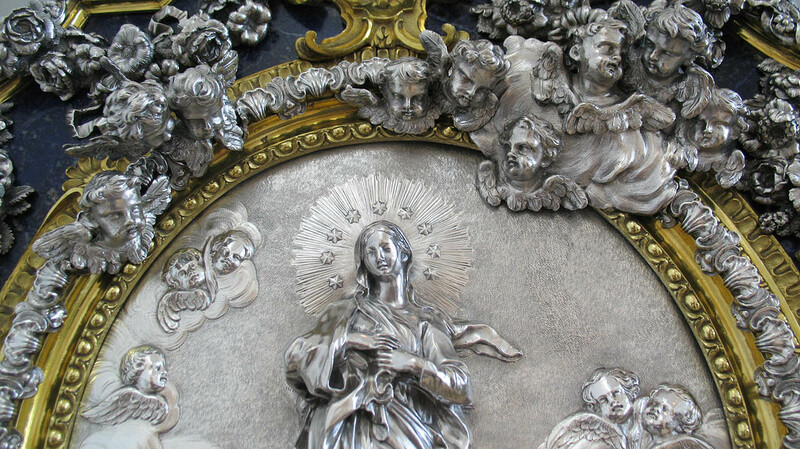 The new arrangement includes two extraordinary works of Italian silver – a monumental Baroque basin, and a finely rendered decorative wall plaque – relocated from other galleries, and two works of German sixteenth- and seventeenth-century silver brought out from storage. 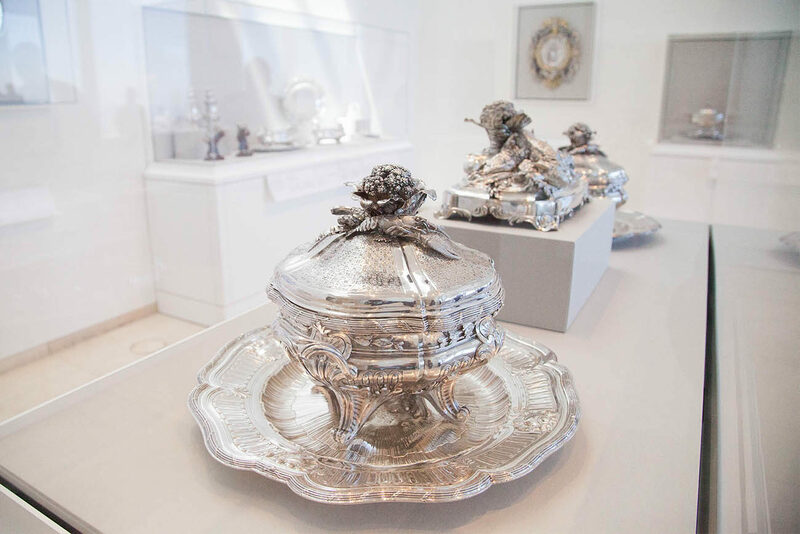 All are being shown together for the first time with the Museum’s collection of French Rococo silver, such as the naturalistically rendered centerpiece, the Machine d’Argent. 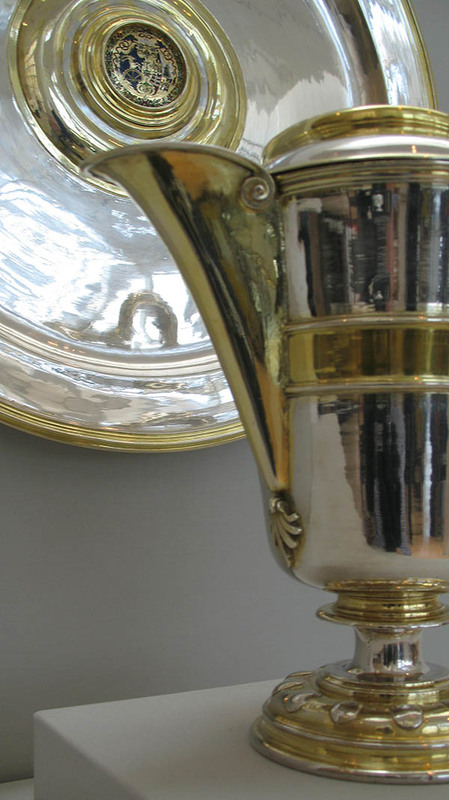 The installation also includes a Neoclassical tureen by the famous English silversmith Paul Storr. It was among the first purchases of decorative art made by J. Paul Getty in 1938, and has never been on permanent display at the Getty Center. These objects can now be viewed more closely, in greater proximity to one another, and in much better light that allows for the many superbly crafted details to be seen clearly. Included below are five images taken just after the objects were installed and before the plexiglass covers where placed over the showcases – offering what we hope will be a few enticing glimpses of these remarkable works of art. This wall plaque is a virtuoso work of casting and chasing silver. The polished surfaces of the central figure representing the Virgin and the cherubs’ faces are set against the duller area of the sky, all framed by a profusion of various small-scale decorative motifs, each exquisitely finished. The surface of the central silver plaque has been stamped repeatedly with a small tool to achieve the matted background. Through such subtle contrasts of textures and finishes, the silversmith ensured that the relief would catch the light in different ways and attract attention from the viewer. Within the rim of this basin, the battle of Actium is represented in furious and graphic detail. This was a conflict in which the combined forces of the ancient Roman leader Mark Antony and the Egyptian queen Cleopatra fought against Octavian, the future Roman emperor Augustus. It marked a decisive defeat in Antony’s career, and he committed suicide soon after, followed by Cleopatra. 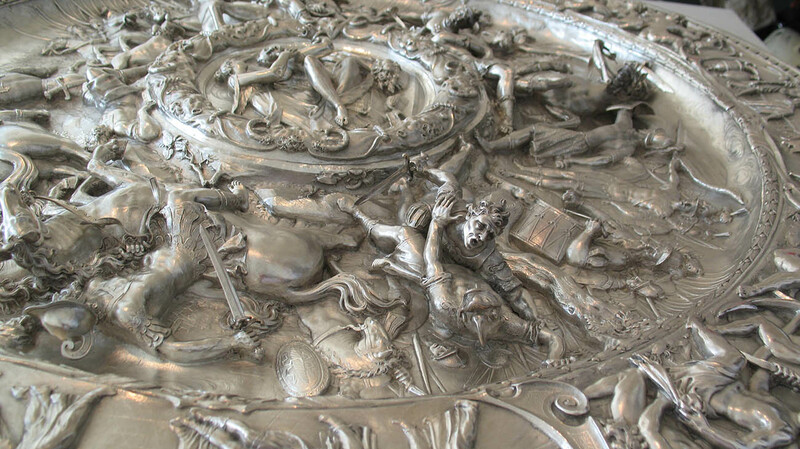 These dramatic events are depicted on the basin in exceptionally high relief with some of the figures cast almost fully in the round, making it a masterpiece of chasing and repoussé work in silver. The principal ornament of this ewer and basin consists of bands and areas of gilded silver that contrast with the plain polished surfaces of the ungilt sections. The result is a highly reflective and showy ensemble. The opulence of the materials and the large size of the individual elements – the ewer is 9 7/8 inches (25 centimeters) high and the basin is 19 7/8 inches (50.5 centimeters) in diameter – would have evoked the wealth and grandeur of the family who commissioned them. 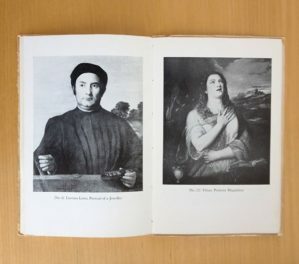 The simple and elegant design appeals to current modern sensibilities, so it is perhaps startling to realize that these pieces were made 433 years ago. 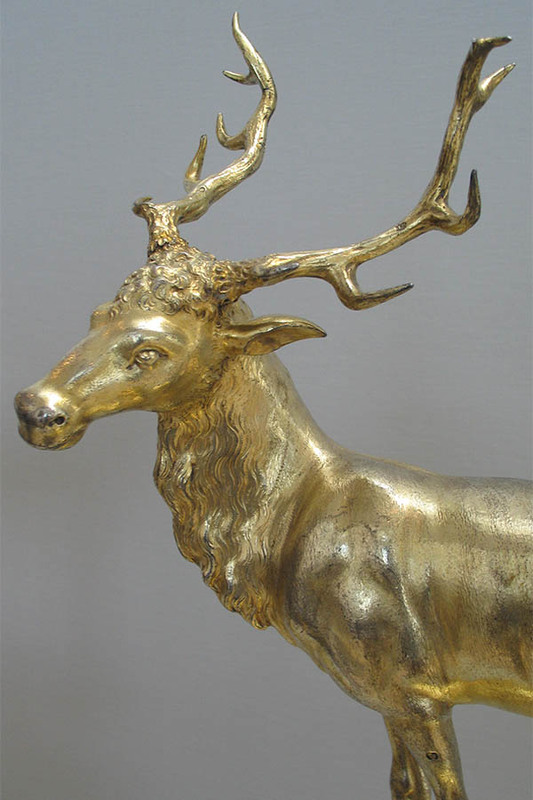 Stately and robust, this figure of a stag is cast in the round. The head and body have been sensitively and realistically modeled, making this an admirable work of sculpture. As a free-standing piece it would have been part of an elaborate arrangement of silver and silver-gilt objects placed on tables or sideboards during formal banquets. Such displays were a prominent feature of noble interiors and included not just the implements and vessels for serving a meal, but also candelabra and small-scale sculpture placed in creative groupings. These pieces would have been illuminated by candlelight, presenting a delightful spectacle for guests as they ate. 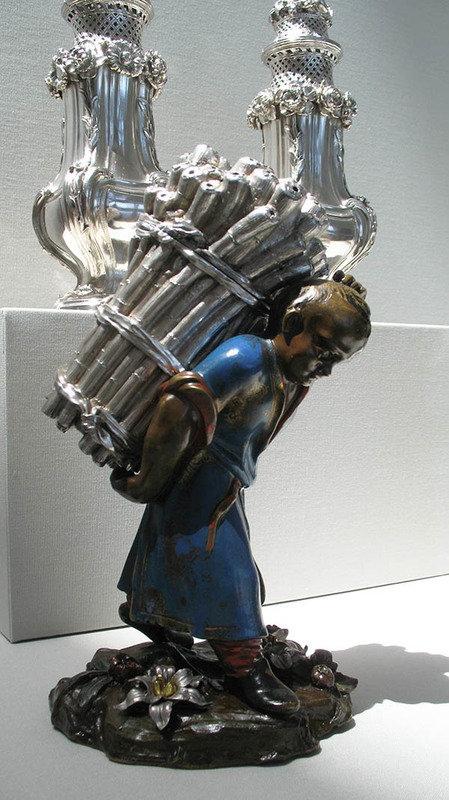 This figure of a boy carrying sugarcane may have belonged originally to Madame de Pompadour, who must have appreciated such a charming and inventive object. At around 2:00 pm this time of year, the sun begins to shine in through a skylight in the gallery and directly onto the showcase in which it rests. The figure is then animated by lively reflections that play off its varied surfaces. Seeing pieces in this light is a reminder that these objects were designed in the age before electric lighting, which is constant and dull, to catch the variable sunlight of the day as well as the warm glow of candlelight at night. The new location of the seventeenth-century Italian silver basin has resulted in an increased appreciation for this magnificent object. 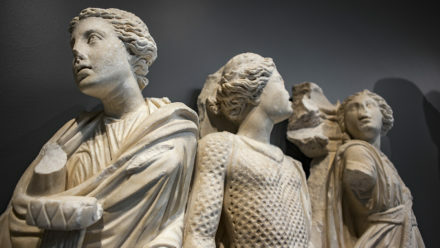 More than one longtime visitor has marveled that they had never noticed the piece before – even though it has been on permanent display in another gallery ever since the Getty Center opened almost 19 years ago. This new awareness is a result of better positioning and lighting. The natural light in the gallery obviously changes throughout the day, and I invite you to visit more than once to see the objects in different lights and to discover new details. For me, each visit increases my wonder and appreciation for the masterful artists who made them. Congratulations on this installation, can’t wait to see it in-person! What an inviting revelation. Seeing the silver in a new light or, in changing light is an anticipated opportunity.